What is single drawn and double drawn hair? To make Single Drawn Hair, the shortest hair is removed from the top of the bundle (the root end) leaving in the remaining layers. How many different lengths remain in the bundle is not a set thing. A person drawing hair can remove 2-3″ from the top or they may remove 7″ of short hair from the top – it will still be single drawn. Making Double Drawn Hair is a technique all done by hand where the longest lengths of hair are pulled from the bundle first. If a ponytail’s longest length is 18″, all 18″ hair is removed. The next layer will be 17″ and that is removed. Proceed up the bundle by 1″ lengths until they are taken out and sorted. Making double drawn hair takes more time, more hair, and the result is a more expensive product where all hair will be the same length with no layers or shorter hairs. Sound impossibly complicated and messy? Not really. It is a skill, however, and it does take patience and practice to get proficient at handling loose, bulk hair. Bulk hair and raw ponytails for hair extensions are everywhere. There’s even sites where people post photos of themselves with their long hair and they’ll cut it and send it to the highest paying bidder (at ridiculous prices, we might add). What you may not know is that there’s something lurking inside those ponytails (or any raw bulk hair for that matter): Shorter hair. You simply cannot turn a 4oz raw bulk ponytail into a 4oz weft or pretipped hair. Raw ponytails can have so many different lengths in the bundle that they must be removed. Trying to tip your own strands from raw hair will result in overly large tips with the hair disappearing into thin ends. Most people will cut the length to even the ends but this is a waste of good hair. If the hair is drawn correctly, the tip to the ends will be more uniform. When our hair grows, there’s natural short layers mixed in with those longer strands. An 18″ ponytail won’t all be that length and you may be surprised by the actual quantity of hair that is exactly 18″. While it may be disheartening, that’s the nature of hair that has not been drawn. We recently took apart an 18″ weft we received from an overseas vendor and created double drawn hair from it to see just how much 18″ hair there really was. We ordered this hair as single drawn so we knew we’d find all different lengths. Because the hair was so thin at the ends, we also knew we’d find a lot of short hairs inside. As you can see, there is very little 18″ hair. There are nine different lengths making up this weft and the largest single length we discovered was only 9″ long. Was this deceptive of this supplier? No. 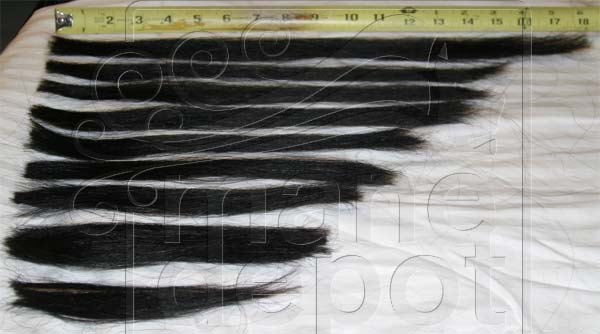 Considering this was sold as “Single Drawn Hair,” we received exactly what we paid for: 18″ will be the longest length with shorter layers included. Knowledge (rather, correct knowledge) is a good thing in the hair extension industry. Knowing the true meaning of terms and how that translates into your received product is never a bad thing for the supplier or the buyer.